For many years, government spending in New York State has far exceeded the national average. State and local governments in New York had the second highest per capita spending in the nation in 2013. Local government spending contributes significantly to New York’s high spending levels. Local government spending in New York averages $9,800 per person – the highest spending level in the nation. Schools contribute the largest amount of local spending in New York. They account for 49% of all local spending, and 61% of local taxes. The contribution of schools to taxes is greater than to spending because a substantial portion of county spending is for social service programs funded by the State government. New York school spending per student is far higher than the average for the nation – 87% higher. Spending is particularly high in the suburbs surrounding New York City. Because of the large regional disparities in school spending levels in New York State, they are likely to exacerbate educational inequality. Compared to other states, New York State spending per pupil is very high – 87% higher than the national average, and is significantly higher than the second state — Alaska (67% higher). Even compared to neighboring states in the Northeast and Midwest, New York school spending is an outlier. 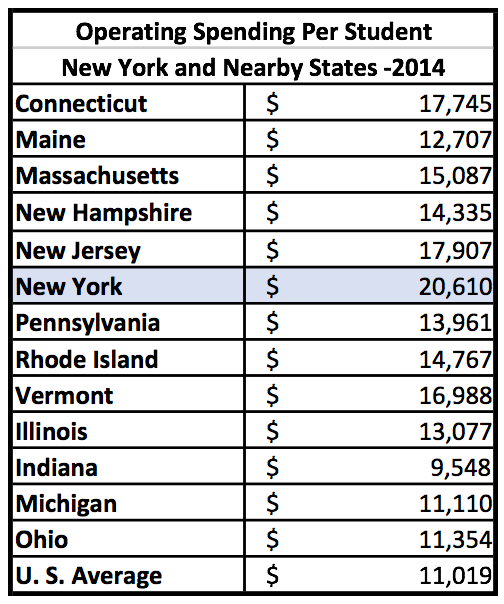 New York’s spending per student is 16% higher than the states with the next highest expenditures – Connecticut and New Jersey and is much higher than the average for the northeast, excluding New York State – $20,610, vs. $15,639 – a difference of 32%. The difference between New York and the average per pupil operating spending in the Midwestern states in the group was even larger – $20,610 vs. $11,556 – a difference of 78%. This post will examine regional variations in school spending in New York state and in neighboring states, and regional variations within New York and neighboring states. Operating spending per student is related to median household income at the state level, with income explaining about 40% of the variation in state average per pupil operating expenditures. Schools in states with median household incomes below the national median of $51,939 spent $9,549 per student on average in 2014, compared with $14,268 for those above the average. 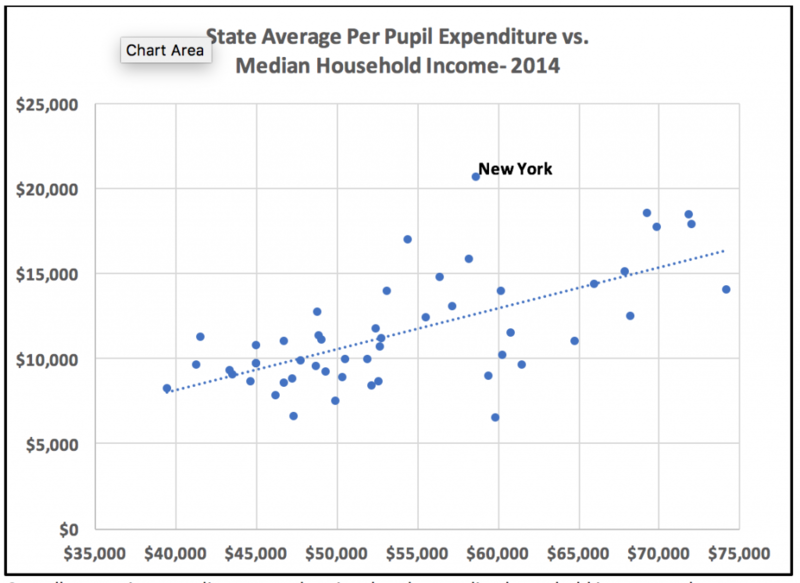 But, New York’s school spending is much higher than would be predicted from its residents’ median income. New York’s median household income was $58,687, 13 percent higher than the national median. The State’s average operating spending, $20,610, was 87% higher than the national average. About two-thirds of New York State’s 19,500,000 residents lived in the New York metropolitan area in 2014. In that area, there is a sharp income division between the 8.4 million residents of New York City, whose median household income is $52,737 and the 4.9 million residents of suburbs in New York State around the city, which average $89,047. The remaining 6.3 million New York residents who live outside the New York City metropolitan area have median household incomes that are like that in New York City and in the nation, about $53,000 on average. Per pupil spending for current operations in New York State largely reflects regional household income differences. Per pupil spending is much higher in the New York City suburbs than elsewhere, averaging $23,680 in 2014. Spending in New York City was $18,579, while the average for upstate metropolitan counties was $16,846. School spending in New York City suburban counties is much higher than for the rest of the state, and far exceeds per pupil expenditures measured at the state level outside New York State. Expenditures in New York City, and in areas outside the New York City metropolitan area are lower, but are like those in the states with the highest spending levels in the region – Connecticut and New Jersey, and significantly higher than the Northeast median of $15,639 and the Midwest rust belt median of $11,556. To understand spending differences between regions within New York State and areas outside the State, it is useful to look at per pupil spending within the major metropolitan areas in neighboring states, and outside those areas. This is so because median incomes in metropolitan areas like New York City, Boston, and Philadelphia are significantly higher than in the rest of the states where they are located. By comparing spending within and outside those areas, we can get a better understanding of how school spending differs in comparable areas within New York State and outside it. Each of the four Northeastern states examined for regional disparities showed similar patterns of median household incomes. Central City incomes were near or below state averages, as were incomes in areas outside major metropolitan areas. Suburbs in major metropolitan areas showed very high incomes compared to state averages and central cities. In each of the three major metropolitan areas studied median household incomes in central cities were between 32% and 52% less than in the suburban communities around them. Philadelphia’s median household income is very low – $37,460, which is 51% less than median household income of the surrounding suburbs. New York City’s median household income was 41% less than the surrounding suburbs in New York State. The median household income for upstate metropolitan counties was like that in areas of Pennsylvania outside the Philadelphia metropolitan area, and below those in Massachusetts and New Jersey outside major metropolitan areas. Per student operating expenditures in upstate metropolitan counties was higher than in neighboring states, averaging $16,846 compared with 12,641 in Pennsylvania and $13,883 in Massachusetts. Median household income in suburbs around New York city was higher ($89,000) than in New Jersey ($71,000 around Philadelphia, and $75,000 around New York City), Pennsylvania ($76,915) and Massachusetts ($80,000). New York City suburbs’ school spending per pupil was much higher than similar areas in nearby states – averaging $23,680 compared with $17,000 in New Jersey, $13,000 in Pennsylvania and $14,810 in Massachusetts. New York City’s median household income was near that of Boston – $52,737 vs. $54,485, but per pupil expenditures in Boston were significantly higher than in New York city – $21,567 in Boston vs. $18,579 in New York City. 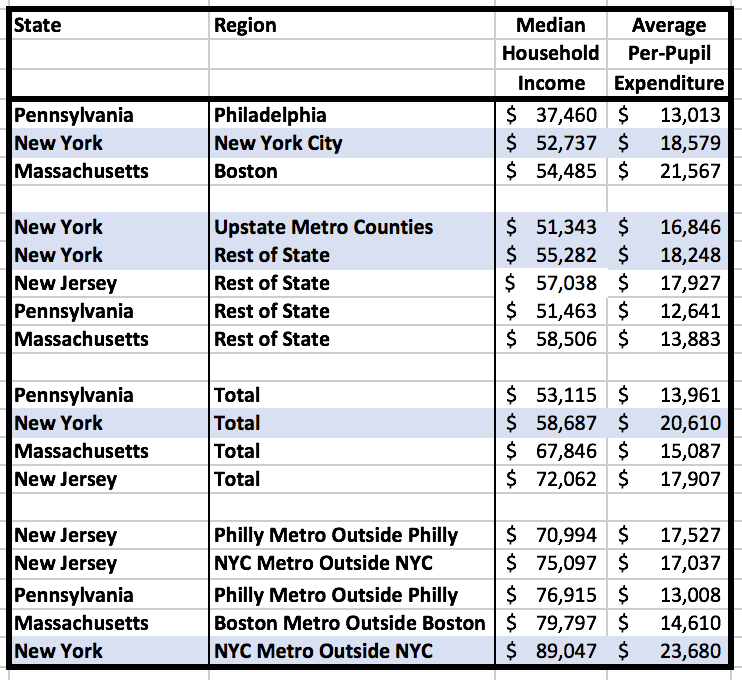 Philadelphia’s median household income was much lower than New York’s or Boston’s – $37,460, and per pupil expenditures were also relatively low for the region – $13,013. Academic studies have consistently demonstrated that the cost of educating economically disadvantaged students is substantially higher than those from more affluent backgrounds. For example, William Duncombe and John Yinger of the Maxwell School at Syracuse University estimated the additional cost of estimating poor students and those with limited English proficiency to be 111% to 215%. Since city school districts have much higher percentages of economically disadvantaged students than the suburban schools around them, to successfully educate their student bodies, per pupil spending should be higher in the cities than in the suburbs. And, in Massachusetts, that is the case – Boston schools spend 48% more per pupil than the suburban schools around them. But in New York State, the reverse is true – suburban schools spend 22% more per student than New York City schools. Suburban areas around New York City, Philadelphia and Boston have significantly higher median incomes than those in the remainder of the states within which they are located. In Massachusetts and Pennsylvania, per capita operating spending differs little from the suburbs of major cities to areas outside those metropolitan areas. But in New York State, New York City metropolitan suburban school spending per student is far higher than in the remainder of the state. 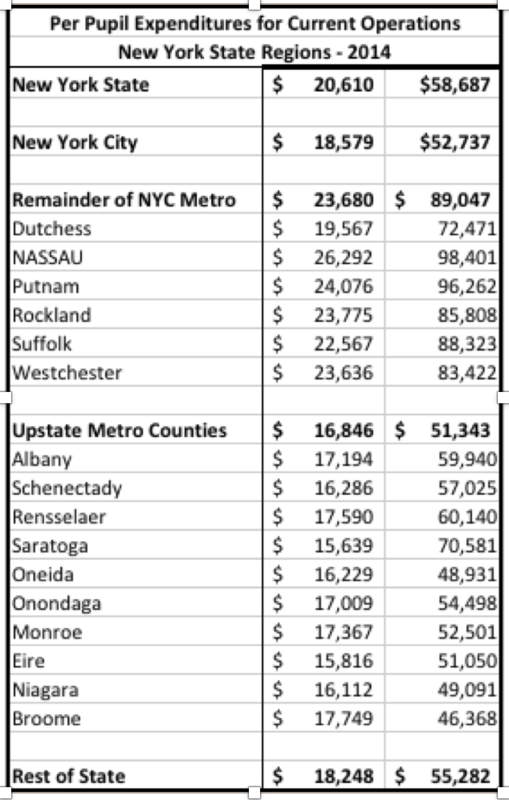 Overall, there is substantially more regional spending inequality between suburban areas and New York City and the rest of the state than in similar areas in other states. Overall, school operating spending per student in New York State is substantially higher than in neighboring Northeast states, and in the rust belt states of the Midwest. Not surprisingly, the contrasts between New York’s high school spending levels are greater compared to schools in places like Ohio, Michigan, Indiana and Illinois than they are with New York’s immediate neighbors, like Massachusetts, Connecticut, Pennsylvania and New Jersey. When the State is broken down into regions – New York City, the suburbs in the New York Metropolitan area, and the rest of the state, only New York City shows spending levels that aren’t out of line with comparable regional entities. The high spending levels found in New York State and its regions cannot be explained by differences in median household incomes, which are small compared with locations outside the state. New York’s per student operating costs are 32% higher than the average of other Northeast states, and 78% higher than Midwest rust belt state. Yet, New York’s median household income is significantly lower than some of its neighboring states, including New Jersey, where the median household income is 23% higher than in New York and in Massachusetts, where the median household income is 16% higher. At the same time, New York has larger, regional variations in per pupil school spending that appear to exacerbate educational inequalities. While the costs of meeting educational needs of students in districts with high concentrations of disadvantaged students are substantially higher than those in places with few of these students, wealthy New York City suburbs spend far more per student than New York City or other parts of the state. These large differences are not found in other nearby states. William D. Duncombe and John Yinger, “How Much More Does a Disadvantaged Student Cost?” (2004) Center for Policy Research, Maxwell School of Citizenship and Public Affairs, Syracuse University. Paper 103.